Home > Bacteria & the Lungs > Which Bacterium Causes Diphtheria? Diphtheria is caused by the bacterium Corynebacterium diphtheriae. This disease is a severe childhood infectious disease that has a fatality rate of about 10 per cent, even if prompt treatment is given. If no treatment is available, the death rate can be even higher. The bacterium is transmitted from person to person via droplets from sneezes and coughs and it mainly affects the upper respiratory system. The tonsils, larynx and pharynx are usually infected and the bacteria form a dangerous web in the throat, which can block the airways. 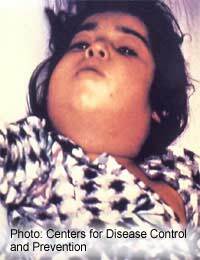 Some children can also develop a very swollen neck, a condition known as ‘bull neck’. The bacteria produce diphtheria toxin, which spreads through the body in the blood. This causes general lethargy, an increased heart rate and low blood pressure. The toxin can also affect the heart muscle and the peripheral nerves, leading to long-lasting complications. The incubation period is about 2 to 5 days but someone who has diphtheria will stay infectious for about 3 weeks. Once antibiotic treatment is given, the infected patient loses the ability to pass the infection on within 24 hours. Wealthy countries such as the UK, other countries in Europe, the US and Australia have very low rates of diphtheria because of the widespread childhood vaccination against diphtheria, tetanus and whooping cough. This contrasts with pre-vaccination days in the 1920s when 200 000 cases were seen each year in the USA, accompanied by around 15 000 deaths. Although widespread vaccination was the key development that reduced the incidence of diphtheria, some reduction was seen before that because of a successful anti-serum. This was made by injecting the diphtheria toxin into animals to raise antibodies, which could then be injected into diphtheria patients to limit the seriousness of their infection. Diphtheria anti-serum was in widespread use from around the turn of the 19th century and the first vaccine followed in 1913. The disease is also relatively rare in sub-Saharan Africa. There are a higher number of cases in South America but the worst affected areas of the world, until very recently, were countries that were part of the former Soviet Union. The political upheaval that occurred in the USSR in the 1980s led to a break down of medical infrastructure and the vaccination rates for childhood diseases fell dramatically. This led to a similarly dramatic increased in children with diphtheria within a very short time. In 1991, in the very early days after the country split there were only 2000 cases but seven years later there were 200 000 cases, and 5000 children died in one year. The countries of Armenia, Lithuania, Estonia, Russia, Tajikistan and Uzbekistan were particularly badly affected with as many as 32 cases per 100 000 of the population. The fatality rate was the worst in Azerbaijan, Turkmenistan and Georgia, where up to 23 per cent of those infected died. The death rate was lower, between 6 and 10 per cent in Armenia, Latvia, Moldova and Kazakhstan, and only around 2 per cent in Russia and the Ukraine. In the last few years, an increase in vaccine production and re-establishment of childhood vaccinations on a massive scale has brought the epidemic of the 1990s under control. The incidence of diphtheria has now been brought back down to pre-1990 levels in most countries affected. However, this is a stark warning: the success of vaccines only last as long as the vaccination programs that dispenses them. If the vaccination were to stop elsewhere, the same effect would become apparent very quickly.